Rapid Run is eager, enthusiastic, and proud. He is a remarkable warrior, often taking on multiple foes with unrelenting courage (though this could be attributed to his hot-headed attitude). 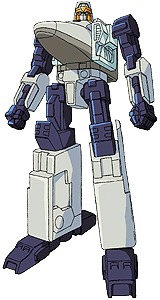 He is very competitive and likes to think of Team Bullet Train as the Autobot's elite force, and of himself as the fastest of all the Autobots. Rapid Run can change to a 700 Series Shinkansen Rail Star bullet train engine. He is armed with a grenade launcher, and can fire large, powerful missiles from his Deflector Shield, which deflects attacks. He forms the lower body and back of Rail Racer.